Improving SEO is not just done from inside the website / blog, but should also use external tools like Google Webmaster. Although there are several tools to monitor and improve your website search engine result page (SERP) on Google, but the most powerful tool are provided by Google itself, Google Webmaster Central. You can access Goggle Webmaster at http://www.google.com/webmasters/, you must have Google account and verify your website ownership. Permanent Redirrect from old URL to new URL, Google will redirrect traffic from your old webstite to the new website. Link with your Google Analytics account. Sitemaps are particularly helpful to tell the Google which page on the blog / website that has not been indexed. 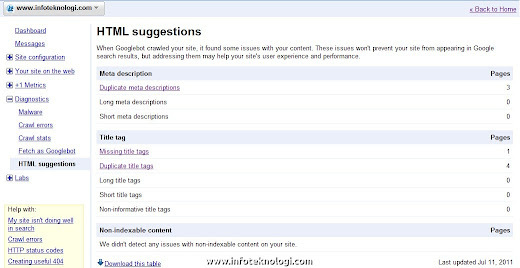 A sitemap usually would have an XML format, or you can submit your feed (RSS or Atom) as sitemap to Google Webmaster. 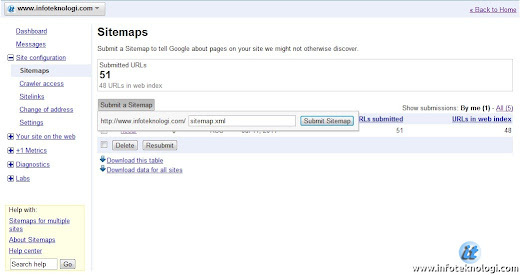 Go to Site Configuration> Sitemaps menu, click the Submit button and enter the location of a Sitemap or feed. If your website / blog in Indonesian language, you expect the reader will come from Indonesia too. By setting up Geographic targeting to Indonesia, your SERP ranking will be higher when people search with google.co.id or filter the search with the options from Indonesia in Google Pages. Geographic Target can be change in Site Configuration menu> Settings> General Settings, click the "Target users in" and choose the country you want to target. Preffered domain is the website address type that you want use when indexed by Google (canonical domain). It will improve your SEO website, because if we don't choose preffered domain, our sites can appear with two different addresses. For example: http://infoteknologi.com and http://www.infoteknologi.com may appear two times in the Google index that causes SERP ranking divided between two different addresses. Crawl rate Setting will make website visited more frequent by Google Bot, usually every website have different setting, you can change the default settings that already determined by Google. If you frequently updating your website content, you should change the settings so Google Bot can visit your site more frequently. By doing that your new content can instantly indexed in Google search. Go to Site Configuration> Settings> General Settings menu, in the Crawl rate options, select Set custom crawl rate. Move the slider to the left (slower) to slowing Google bot visit, or move to right (Faster) to ask Google bot visited the website more often. HTML Suggestions error or warning will show your website error that found by Google, fixing this error can enhance your SEO website and increase Google SERP. To view suggestions or warnings that Google found, go to Diagnostics > HTML Suggestions menu. Although there are still other options in the Google Webmaster, I won't discuss it coz most of them are informational only.